Tonight I worked with the great Phil Jackson! Ok, ok. It was actually a dog named Phil (left) and another named Jackson, no relation. Phil and Jackson’s guardian called me to help with a few different issues, barking, not listening, pulling on the leash and failure to recall on command. It didn’t take long to see why the dogs acted this way. Their guardians let them climb up on top of them literally as if they were the dog’s furniture. And each time one of the dogs climbed up, the guardian would immediately start to pet them. This was wrong in so many ways. First off, when a dog climbs up on top of you in such a flagrant way, it says the dog has little respect for you. A dog would never go and climb up on top of a more senior dog that way. 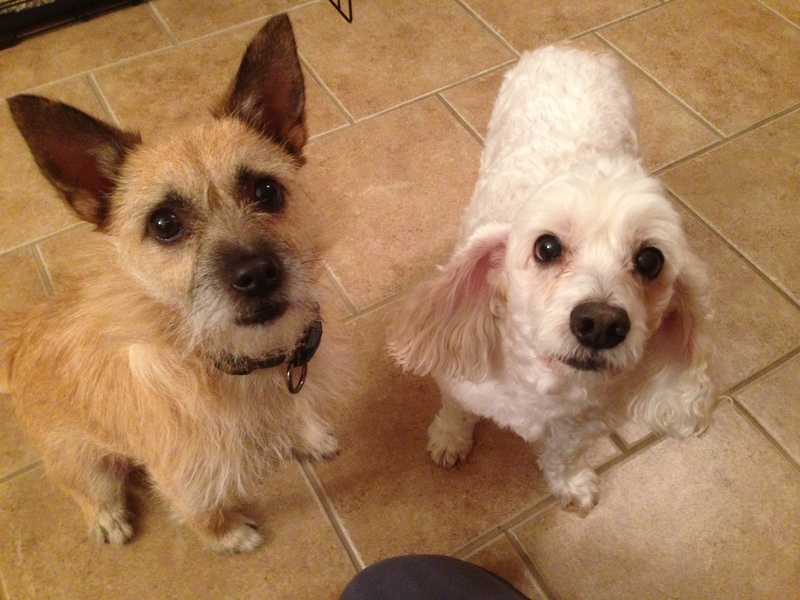 While a dog should always feel free to climb up in a lap when invited, these dogs did the inviting themselves. By petting the dog when they climbed up, they were rewarding the behavior and acting as a follower themselves. By petting them on demand, i.e. when the dog climbs up, the dogs are essentially giving the humans orders; “pet me.” Each time that the human obeyed that order, it reinforced the exact opposite leadership structure their guardians tried to establish. In order to flip the script for these dogs, I suggested the addition of some structure by their humans. By adding some rules and limits to the dog’s daily lives, their guardians will be in a position to correct them which reinforces their leadership status. Next I went over an exercise to introduce the concept of boundaries as I wanted to show their guardians how to use territorial limits as another way to enhance the human’s authority in the dog’s eyes. Because distance has a correlation to a dog’s reaction to stimuli, I wanted to teach their guardians to add boundaries that involve the dog keeping itself away. At first we practiced at the door. 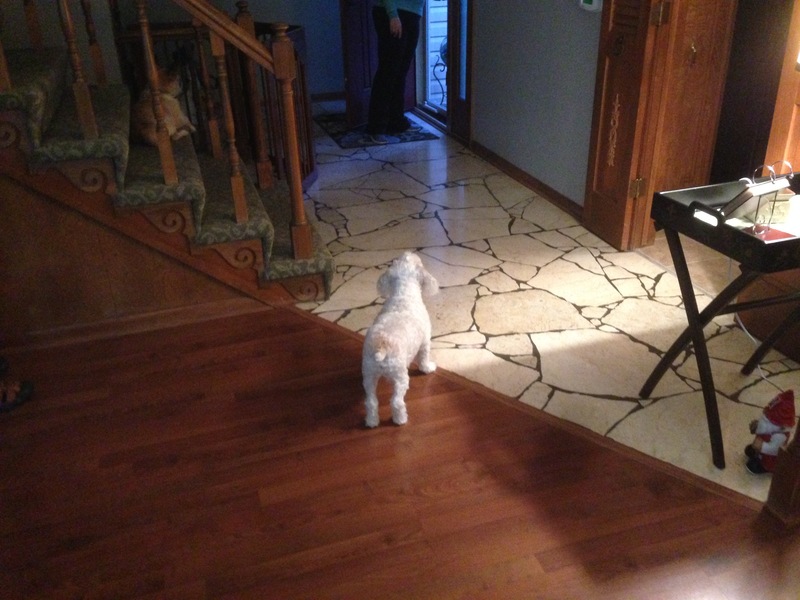 As soon as they heard a knock, both dogs immediately rushed the door barking. I walked to the front door and as soon as I was past the dogs, I turned so the door was at my back. Because Jackson was far more intense, I focused on him and ignored Phil. I took a sudden and deliberate series of steps toward Jackson while making a hissing sound to disagree with his actions and presence. Jackson slowed his barking and moved back once he saw me. Once I determined he was staying in place, I moved back to the door and turned my attention on Phil. Phil was much easier to move away. Once the dogs were about 12 feet away from the door, I walked backwards towards it while keeping my front facing the dogs. Jackson got up a few times so I reversed course and marched right at him every time he crossed from the wood on the the stone floor around the door. Each time I addressed Jackson, his intensity and energy dropped. Only once the dogs were calm and behind the 12 foot boundary did I open the door. We repeated the exercise so that one of his guardians could practice the same technique. While Phil moved away to a position on the stairs 12 feet away from the door, it took his guardian a little longer to get Jackson to stay behind the line. While it took a good five minutes to get the dog to move behind the line, the exercise had a continuing effect. Jackson’s barks were delivered with less intensity and he started to zone in on the boundary line. The more their guardians practice this exercise the easier it will be to correct the dog from passing the 12 foot boundary. To give their guardian another way to practice establishing a boundary I suggested we feed the dogs. Because dogs eat in the order of their rank or status, controlling the feeding ritual can go a long way towards redefining the leader follower dynamic. I had their guardian establish a boundary at the doorway into the kitchen. Only after the dogs understood they were to wait outside of the doorway did their guardian place food into their bowls. 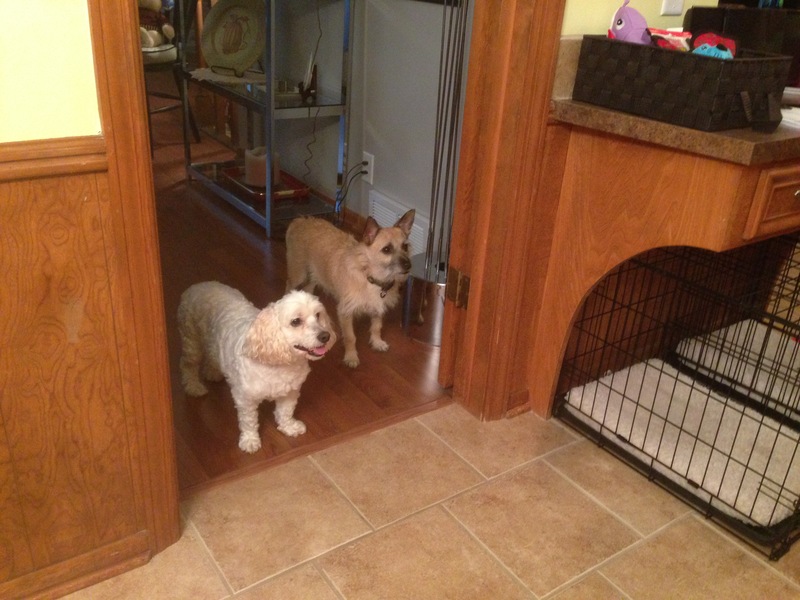 As soon as the dog’s heard the food fall into the first bowl, they got up and tried to enter the kitchen. Their guardian put down the food and reacted immediately rushing right at the dogs while making a hissing sound. Both dogs stopped in place and Phil even sat down. She walked backwards to the bowls and resumed filling them, stopping and correcting the dogs in the same way each time they tried to come in. It took a few corrections, but eventually the dogs sat or stood outside the kitchen doorway boundary. I had their guardian snack on a few chips leaning against the wall while the dogs stood and waited. When she was ready, she invited Jackson into the kitchen and corrected Phil when he tried to come along with his room mate. By controlling who has access to the food, their guardian gets to practice correcting them while assuming a more authoritative position in the dog’s eyes. By the end of the session, the dogs were completely calm, were responding to their guardians commands and even starting to self police themselves while respecting the new rules and boundaries. It will be important that their guardians practice the exercises and enforce the new boundaries and rules. As the dogs get more practiced, the changes in their behavior will continue to improve until the unwanted behaviors stop altogether.